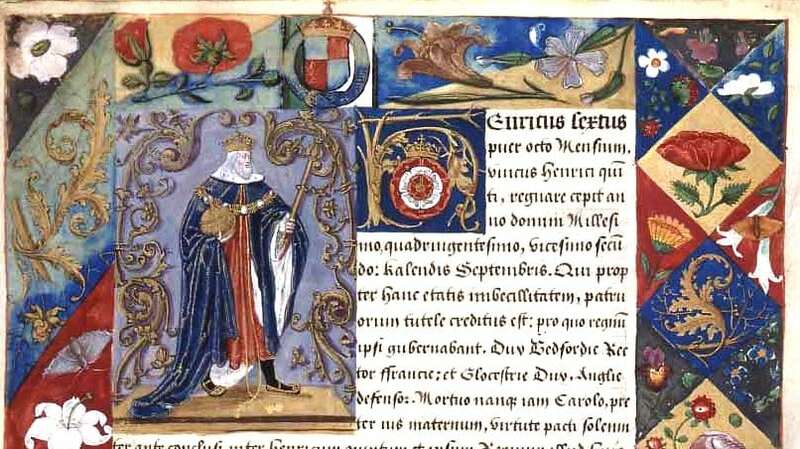 As we have seen in my previous blogs most manuscripts were written before they were decorated. Scribes often doubled as page designers, planning the hierarchy of decoration in line with the articulation of the text. They left room for the illumination and prompted artists by inserting faint letters in the spaces where historiated initials were to be painted. The artist almost always painted the initials suggested by the scribe and also made use of the lines ruled across the space intended for the miniature when transferring compositions throughout the volume, as can faintly be seen in some of the illuminated miniatures in our precious holding, Liber Niger, the ‘Black Book’ [SGC G.1]. The artist would sketch out the design of his miniature with a plummet and then firm it up into an ink drawing. By following this under-drawing the illustration would be developed to a remarkable level of coloured detail, showing the confidence and fluidity of a truly accomplished artist. Before leading on to the application of gold it is worth considering who these artists were. Manuscript artists in Europe were predominantly monks working in monasteries and we know many of them as masters of their art, eg Master Hugo, Virgil Master, Master of the London Pliny, Master of Ippolita Sforza, etc, etc. There were also some known women artists, nuns working in nunneries including Hildegard of Bingen (1098-1179) and Sussanah Hornebolt (1503-1545). I believe that the reason why we are not aware of many more female artists is because it was considered unseemly and against their religious vows to claim ownership of their work. The next stage in the decoration of the manuscript is the application of gold. Sometimes liquid gold would be painted onto the vellum page to gain maximum impact under candlelight, this in the most precious and expensive commissions. But the less expensive option was to use gold leaf. Beaten into sheets thinner than tissue, loose gold leaf crinkles at the faintest current of air, dissolves into dust if handled roughly, and, most importantly, clings to painted surfaces. It was carefully laid over areas brushed with gum arabic, fish glue, or beaten and strained egg-white, known as glair. Flat gold leaf was often left unfurnished, as can be seen in the Black Book. For a raised effect, gold leaf was laid over gesso, a compound of plaster, white lead and glue, which was often coloured with salmon-pink to enhance the glowing warmth of the gold. The gesso formed a ‘cushion’ making the thinnest gold leaf look solid. The Schorn Book of Hours (1430-1450) [SGC LIB MS.6] has wonderful examples of gold and coloured historiated initials and border decoration. The gold has been burnished with a ‘dog’s tooth’, a smooth hard stone such as agate to give it a lustre as bright today as it was five hundred and sixty five years ago. Gold glows and shimmers with the light, revealing the dazzling beauty and true essence of an illuminated manuscript, and just as all the colours illuminated the pages of these sensational books so long ago, they continue to do so as well as illuminate the past for us today, and for others, well into the future. 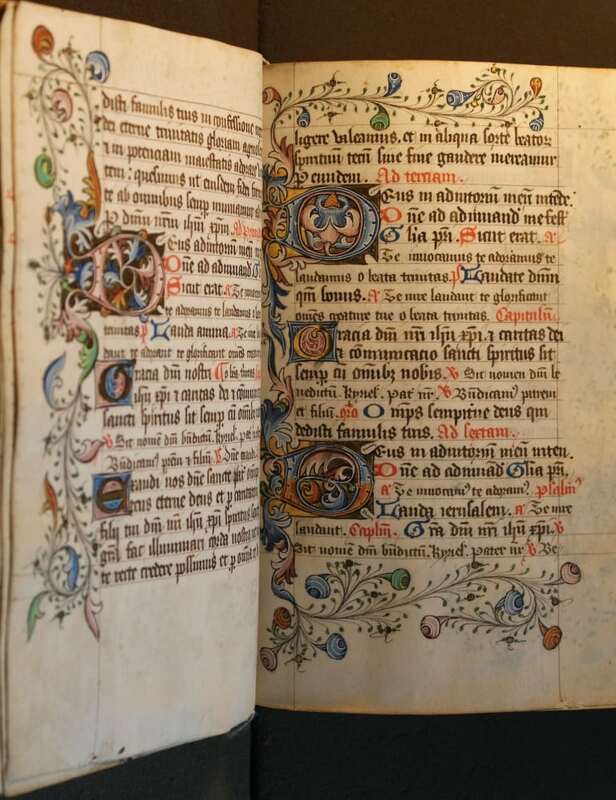 Because the pages of illuminated manuscripts are kept closed most of the time, and indeed for hundreds of years, they are kept clean and safe from handling and light, and other than repairs to torn pages and minimal dusting, conservators are wise to maintain a ‘minimal intervention’ approach to these precious works of art.